Spruce trees are common landscape plants and provide habitat for wildlife. Healthy spruce trees can live 200 years or more, according to Northern State University. They differ from other members of the Picea genus by the structure of their needles and bark. 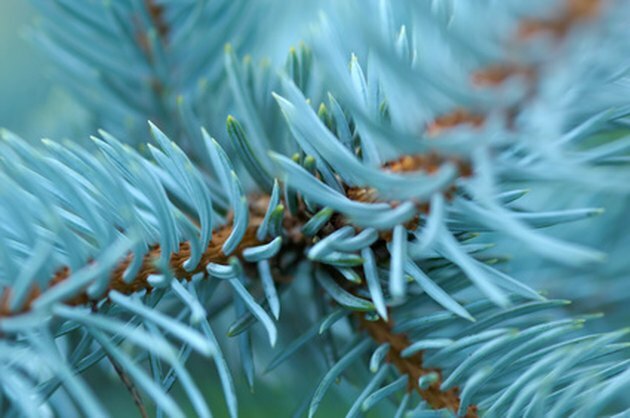 Healthy spruce needles are 1 inch long, sharp and stiff. Spruce trees have flaky, thin bark and the branches form small pegs from which the needles grow. Pests and diseases threaten the health of spruce trees throughout the year. Planted spruce trees benefit from regular maintenance. Discolored spruce needles are a sign of disease. Water recently planted spruce trees regularly. Weekly soakings during dry weather is sufficient, according to the University of Wisconsin Extension. Established trees require regular watering if they are planted near a foundation or under an overhang. Spread organic mulch around the spruce. Organic mulch adds nutrients to the soil, retains moisture, reduces weeds and maintains soil temperature. Organic mulches include straw, pine needles, hay, wood chips and shredded bark. Fertilize spruce trees in late autumn or early spring. Spread aged manure around the tree and work it into the surface of the soil with a shovel or garden rake. Avoid damaging any tree roots while digging around the tree. Watch for signs of pests or disease. Discolored needles and dying branches are signs of disease in spruce trees. Remove pests from the tree by weekly doses of a strong spray of water over the center of the tree and throughout the foliage. Cut back the main leader stem, if it is damaged. Tie the highest side shoot to the cut stub to create a new leader. Avoid "winter burn" by thoroughly watering the roots and surrounding soil before the soil freezes in autumn. Spray the tree with lime sulfur in the early spring, if the spruce has pests such as scales or mites.